TN MRB Recruitment 2019 - Apply Online for 520 Nurses Posts (SNCU) in TN MRB, Chennai, Tamil Nadu on Contract Basis. 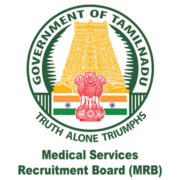 Online Applications are invited by Tamil Nadu, Medical Services Recruitment Board (TN MRB) from 06 Feb 2019 to 26 Feb 2019 for 520 vacancies. Candidate should have acquired the Degree or Diploma in Nursing and permanently registered with the Tamil Nadu Nurses and Midwives Council.